This reasonably priced device aims to replace traditional phones. Although the use of video conferencing has become more common in organizations, the technology often falls into one of two categories ripe with pitfalls: It’s either an inexpensive, low-quality affair or a high-definition in-room system that’s too expensive to deploy widely. 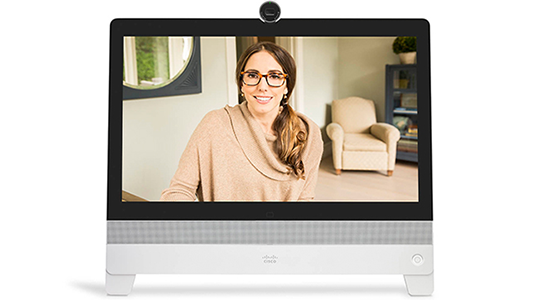 Cisco’s DX80 video conferencing kit aims to bridge that gap by offering extremely high-quality desktop video conferencing at a reasonable price. In fact, the device may just be able to kill off traditional phones for some workplaces. The sleek DX80 sports a large 23-inch screen with an 8-megapixel camera mounted on top that’s capable of capturing true 1080p video. Setup takes less than five minutes — about the same as an all-in-one PC, which it highly resembles. While the DX80 is a full Cisco IP phone, it’s also like a giant Android device in that it supports any app designed for that platform. Installation of collaboration apps, such as Jabber and WebEx, went smoothly. The product can also support multiple logins (for instance, from a thin client), making it suitable for environments where desks are shared. Users will find it simple to make a call with the DX80. They either touch the picture of the contact they wish to dial or enter the desired number using the touchscreen. Calls can also be made to email addresses, which will open up a video bridge between the DX80 and any other video conferencing unit on the other end. If the person called doesn’t have a video phone, then the DX acts like a regular phone. Connecting to other DX80 units is where the phone’s features really shine. With the DX80’s beautiful HD quality, a call between four people feels as though they are all sitting in a room together. The unit even switches the active window automatically to the person speaking, moving other participants to smaller windows until it’s their turn to chime in. The DX80 supports multitasking during calls, so users can check their email or compose instant messages while participating in a conference. Computers attached to the DX80 can share screens and receive feedback as if the device were an interactive whiteboard. Users can drag and position the video windows anywhere they want on the screen to keep them from blocking important information. The system even works to keep everyone in focus and near the front of their screens, and the audio zeros in on the speakers, muffling any background noise from the rest of the classroom or office. Having a face-to-face meeting is always better than one through audio only, and the unified communications capabilities of the DX80 make it a valuable tool. It offers quite a few features previously found only in large conference rooms, but at a desktop-friendly price.